This paper describes a refinement to our procedure for porting lexical conceptual structure (LCS) into new languages. Specifically we describe a two-step process for creating candidate thematic grids for Mandarin Chinese verbs, using the English verb heading the VP in the subde_nitions to separate senses, and roughly parsing the verb complement structure to match thematic structure templates. We accomplished a substantial reduction in manual effort, without substantive loss. 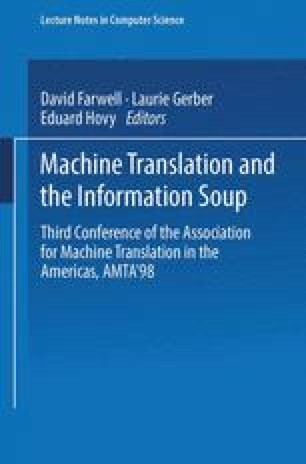 The procedure is part of a larger process of creating a usable lexicon for interlingual machine translation from a large on-line resource with both too much and too little information.